In a competitive job market, your resume plays a critical role. No matter how experienced or skilled you are in your field, if you do not properly market yourself in your resume, you might not get the chance to interview for the job you want. That is why it is essential to put a lot of thought and care into constructing your document. Use our healthcare administration resume templates and follow our useful writing guidelines to learn how to make each section of your resume stand out. 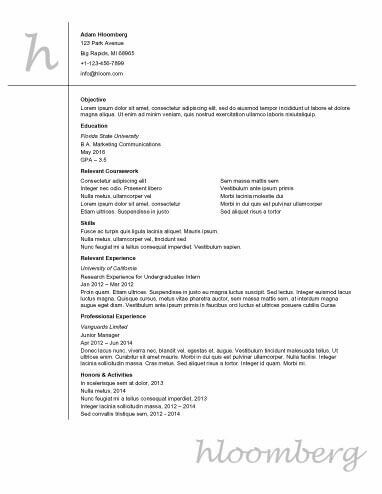 As you write your document, compare it to these well-written resume examples to make it even stronger. Before you know it, you will have a standout resume that increases your chances of landing job interviews and, ultimately, a new position. Why Use Healthcare Administration Resume Templates? The Bureau of Labor Statistics predicts healthcare administration should grow by 20% by 2026, which is a much higher growth rate than the rates for many other industries. While this does point to more job openings in the future, it also suggests stiff competition as recent graduates and other career-changing professionals flood the job market. If you want something that offers a little more flair than a basic and simple template while still keeping to a similar standard format, check out these clean healthcare administration resume templates . Clean templates focus on fonts, color, and white space to create professional formats with some eye-grabbing modern styles for impressive finished looks. Still unsure which formats and styles are best for your document? Browse through our most popular options to find some of the top healthcare administration resume templates out there. These options are favorites in terms of formatting and style so you can find the most suitable one for your industry, experience level, and particular tastes. New to this field? Use one of these entry-level templates to put your best foot forward. Our templates utilize formats that focus on professional strengths such as skills, volunteer work, and education. This makes it much more likely that hiring managers will pay attention to your transferable attributes instead of your lack of relevant experience. Our one page healthcare administration resume templates and guidelines help you determine what to include and exclude in your resume in order to fit your best qualifications on one page and appeal most to hiring managers. These templates utilize space well so you can fit a good amount of pertinent information without losing reader-friendly white space. Perfect for conservative and traditional industries, our basic and simple healthcare administration resume templates offer organized layouts so you can present your qualifications in a straightforward and professional way. We offer many different designs so you can choose whichever is most visually appealing. Universally accepted, basic and simple templates are particularly convenient when applying to many different types of jobs. Did you know that most recruiters spend only six seconds glancing at a single resume? You might not know what parts of your resume they skim through during those few seconds, but you can make sure that your entire document is ready for the challenge. While our healthcare administration resume templates use designs and formats that include the vital components of a professional resume, always make sure your document contains the following sections to keep it out of hiring managers’ trash cans. Summary Statement: Similar to an elevator pitch, the summary statement is concise and straightforward. It includes a few of your top professional qualifications and emphasizes how you might benefit your employer if hired. Most jobseekers include a summary statement rather than an objective statement. Objective Statement: This statement explains what you want or need from a potential job. Most employers consider the objective statement outdated, but it is still appropriate for some industries. • Receive your finished document and then download, print, and send with your applications! With our resume builder, it has never been easier to create a standout resume. We do most of the hard work for you so you can construct a finished document in no time that is worthy of your qualifications. Don’t waste another minute—get started now to obtain a professional and attractive resume that you can confidently send to potential employers.